Well I finished my reading challenge for June on 30 June and have been trying to write a review. That has been challenging in itself. Once happy with it, I will share. I love the excitement of choosing the next book to read. I had bought the follow up to Me Before You written by Jojo Moyes, After You, but did not want to read that before I had seen the film so I chose to read a book I had bought when it was on special last year, Summer of ’76 by Isabel Ashdown. Everyone talks about the hot summer of 76 (well us who have experienced it). I was only 10 at the time but I do remember not being sent home from school whilst the students from the local senior school where only too happy to taunt us because it had been too hot for them and they were allowed home early. It is based in the Isle of Wight – just across the water from me – and a place I would have spent some of my summer holidays. The main character, Luke, is due to go to Brighton Polytechnic after the summer holidays. Again, Brighton was another childhood favourite of mine and somewhere I have really enjoyed going with my children and where I was going on an adventure with my friend Karen. I have been reading the book for a week and just like my holidays in the Isle of Wight, the book is following a slow pace. Each chapter starts with the temperature in Fahrenheit. I wasn’t impressed with the May temperatures at all but now I am in June and it is 91° and I want that now! There is also a secret that is waiting to be told which is likely to increase temperatures again. I am enjoying reading about the food and music from the era. Luke’s mum is trying to make her own wine which brings back memories of my dad brewing his own beer. Luke is also working on a holiday camp which is somewhere I would have stayed at during my visits to Isle of Wight. Once finished, I can finally start After You because I finally went to see Me Before You last night. 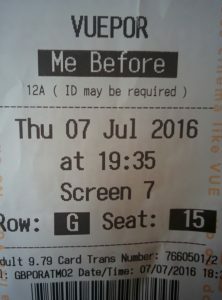 Me Before You was the first book I read by Jojo Moyes. To say I enjoyed it seems so wrong as the subject isn’t something you would talk about openly. Whilst tissues are needed for the book, there is certainly a great deal of real life and humour. Lou, one of the main characters, is just so fun and loving. I knew I would not be disappointed with the film because when I saw interviews with the lovely Emilia Clarke, I was so impressed with how she was the perfect Lou that I had read about. I loved so much about Lou but especially her shoe collection. 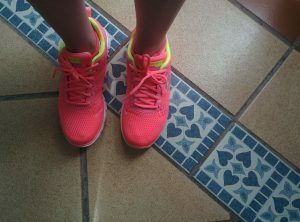 Wouldn’t it be great to have those lovely shoes and to have the nerve to wear them – mind you, I do wear bright pink skechers. I also remember my daughter wearing woolly tights and wellington boots on a summer’s day so hearing Lou describe her favourite things with her stripey tights at top of her list did put a smile on my face. Sometimes when I watch a film after reading a book, I can be disappointed. This film was everything I imagined and the cast were fantastic. It is an extremely sad story and there will be always be strong opinions around the subject. I could never express an opinion on the subject but I do think the story allowed me to see sides to everybody involved in the decision making. I am looking forward to reading After You even more now. 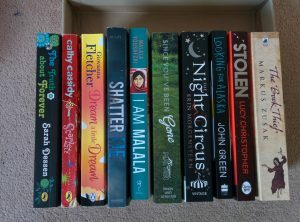 I do love my kindle but challenge number 6 is to read my daughter’s 10 favourite books in paperback. I have been given the collection and will also be choosing something from that very soon.